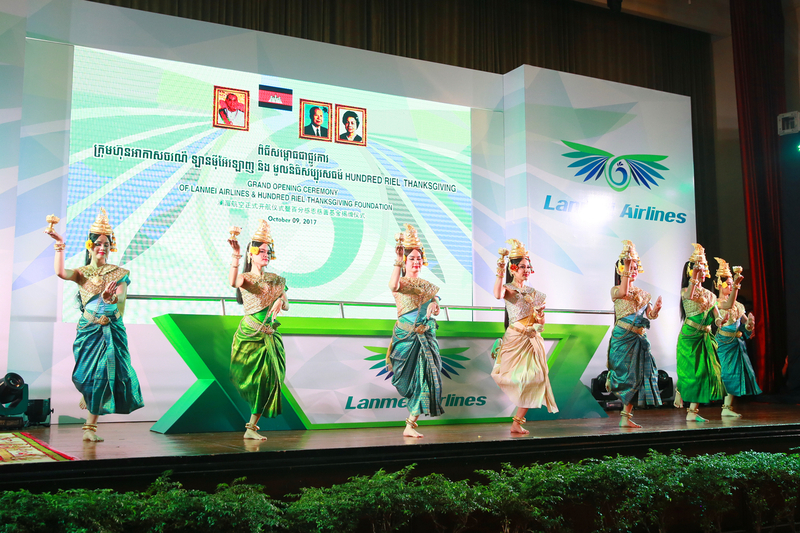 On Oct.9th, 2017, Lanmei Airlines (Cambodia) Co., Ltd. (referred as “Lanmei Airlines”) held a grand ceremony of Lanmei Six Nations Flights Launching and the “One-hundred Riel” Thanksgiving Foundation at Phnom Penh. The distinguished guests such as His Holiness, Samdech Sanghareach, Venerable Monks, and H.E. Hor Namhong, Deputy Prime Minister, H.E. Mr. Xiong Bo, Chinese Ambassador, H.E. Senior Minister Ly Thuch, H.E. Civil Aviation State Secretariat Mao Havannall, H.E. So Mara, Secretary of State, Ministry of Tourism, Pol. Gen. Chhay Sinarith, H.E. Secretary of State David Luy, Ministry of Foreign Affairs & International Cooperation, H.E. Chea Vuthy, Deputy Secretary General of CDC, General Director, Design master, Mr. Shao Xin who designed Lanmei Airlines’ logo, Vice President Jock Seals, AERCAP, Mr. Yang Xiaobo, Executive Director of GGL, Mr. Chen Changjiang, Chief of Phnom Penh Branch, BOC, and nearly 200 press reporters attended this ceremony. The ceremony started with Cambodian blessing dance, and then Chairman & CEO Dr. LI Kun made a speech. 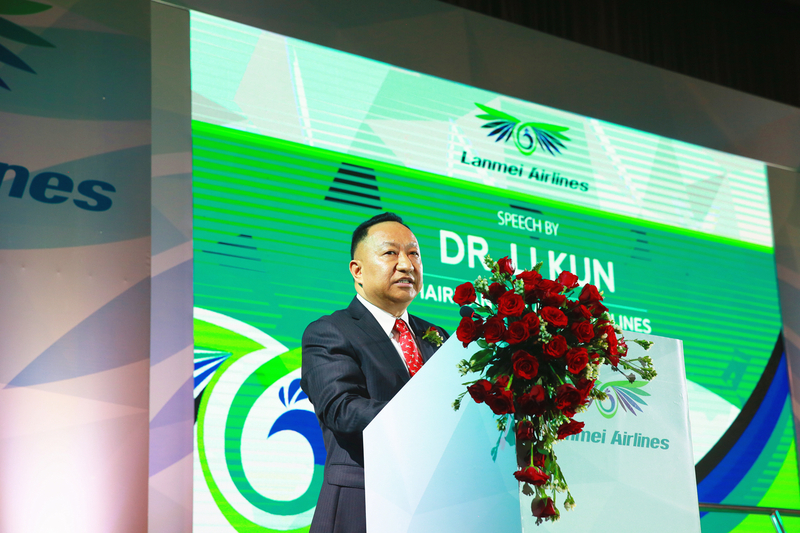 He said, without supports from Cambodian and Chinese government and local airports, it is impossible for Lanmei Airlines to succeed in its preparation and maiden flights. 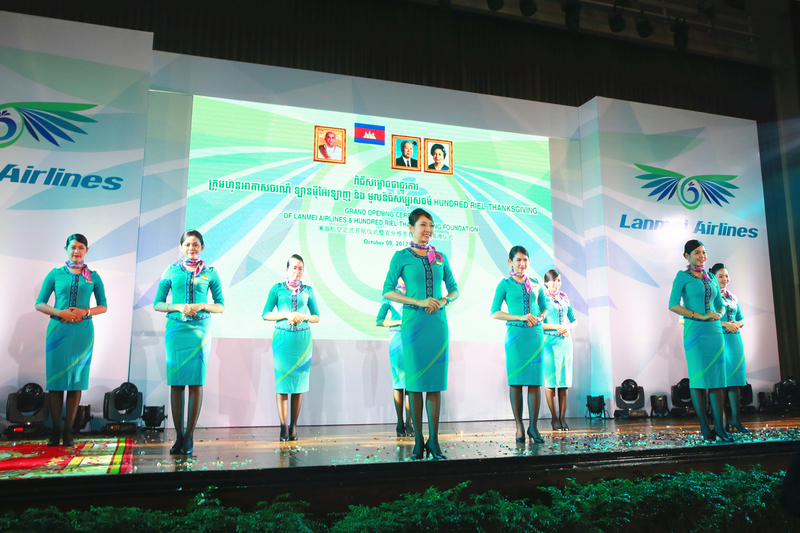 Lanmei Airlines aims to promote Connectivity, to serve Cambodia's “Quadrangle-Development Strategy”, and China’s “B&R Initiative” and “LMC”. 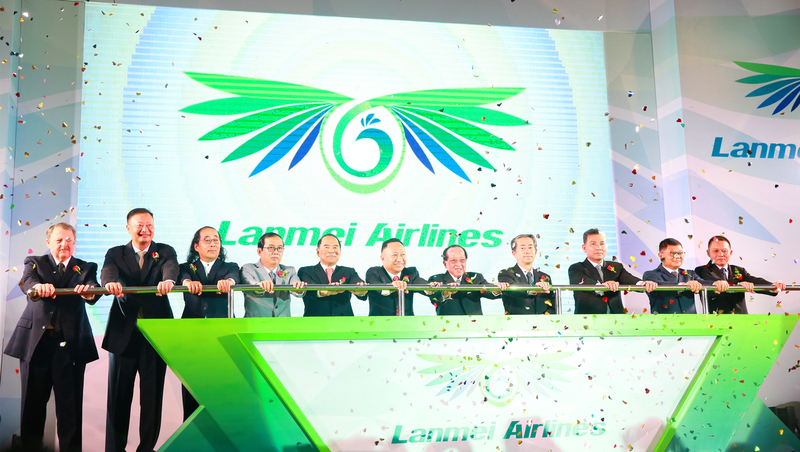 Lanmei Airlines has designed “369”Development Strategy and will have 6 aircraft in the first year and aim to reach 20 within three years. Its “Public Air” operating mode is “Three Big, Three High, Three Special and One Low”. With safety as its greatest priority, Lanmei Airlines will enhance its services and further the innovation of management mode to boost profit, to then reward our country and society. H.E. 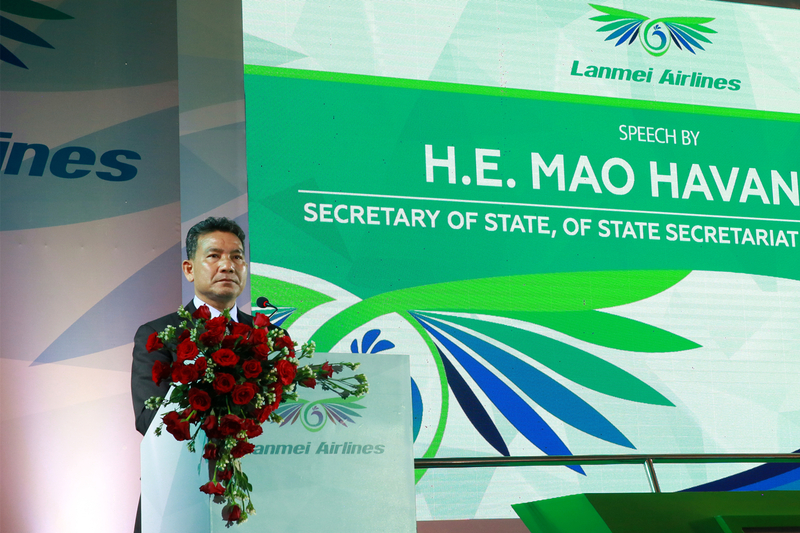 Hor Namhong congratulated to Lanmei Airlines’ kicking-off its mission. He said, the launching of Lanmei Airlines, new international airport of Siem Reap and highway of Sinanoukville are all in “B&R” Initiative. 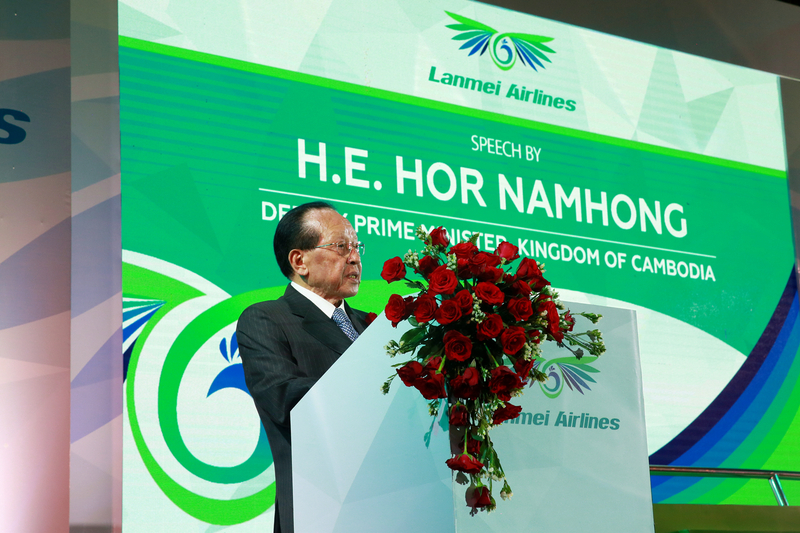 He believes that Lanmei Airlines will grow into a well-known air company, and build a “sky highway” for Lanmei six countries to transport more Chinese and other countries visitors to Cambodia. He also thought highly of One-hundred Riel Thanksgiving Foundation set up by Dr. LI Kun and Lanmei Airlines. It is noble to donate part of revenue to social charity. Civil Aviation State Secretariat H.E Mao Havannall made a judgment that as a creation of a new airline, Lanmei Airlines is a historic moment in many ways and “it is another step in the deployment of the Trust Together Strategic Partners.” In 2016, Chinese President Xi Jinping and Prime Minister Samdech Techo Hun Sen agreed that Cambodia plans to receive over 2 million Chinese tourists by 2020. H.E Mao Havannall hoped that Lanmei Airlines can help reach the target and it will be a remarkable milestone to aviation industry of Cambodia. He said, SSCA will support Lanmei Airlines development and wish Dr. LI Kun to build up a new air brand of “Public Aviation” to make contribution to social development of Greater Mekong Six Countries. 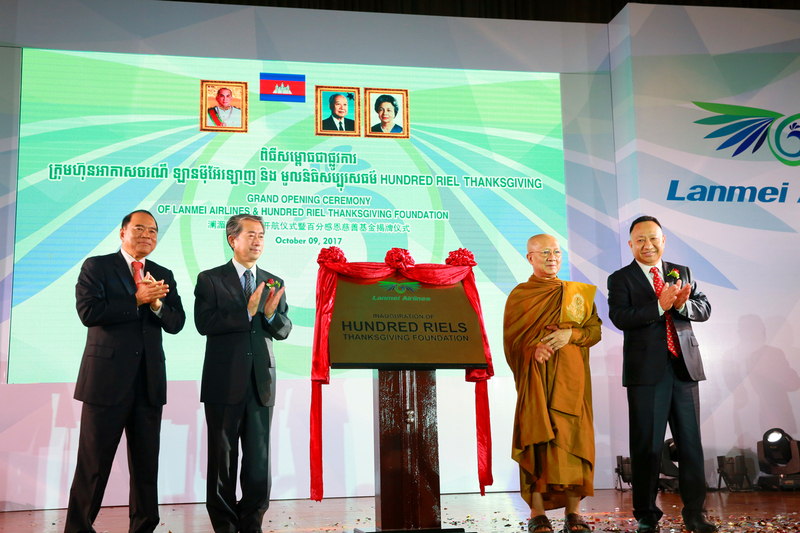 Together with distinguished guests, Chairman LI Kun and Vice Chiarman HAN Yunfeng pushed the launching startup handle to wish Lanmei Airlines speed up open flights between Cambodia and Vietnam, Laos, Myanmar, Thailand, and China and to set up an economic cooperation, cultural exchange and friendship and mutual trust “sky highway” between these six countries. Lanmei Airlines started up the “One-hundred Riel” Thanksgiving Foundation, whose purpose is to promote Buddhism and help children from less privileged backgrounds. The name “One-hundred” signifies its commitment to donate one hundred Riel of each purchased ticket fare and highlights its “one-hundred percent” devotion to its social responsibility and charity. On the ceremony, His Holiness, Samdech Sanghareach, Venerable Monks, H.E. Mr. Xiong Bo, Chinese Ambassador, H.E. Senior Minister Ly Thuch, and Chairman LI Kun unveiled the nameplate of the Thanksgiving Foundation. Cabin crew from Lanmei Airlines showed a sign language performance “Thankful Heart”. Lanmei Airlines’s logo looks like a peacock spreading its tails. Lanmei Airlines chooses peacock as logo because it symbolizes propitious totem in both oriental and western culture. The six feather of the wings-like logo represents the six Greater Mekong River countries who are the community of shared destiny & shared river. The logo also looks like a rotating aircraft engine, implying to supply new and steady thrust to these six nations. On Sep. 29th, the maiden and testing flight from Sihanoukville to Macau was successfully launched, which indicated the “Public Aviation” mode of Lanmei Airlines has commenced, i.e.big aviation market, greater network and big products. Lanmei Airlines’ strategy is to build up consensus, to help development, and to share benefits. Phnom Penh, Siem Reap and Sihanoukville as three bases, Lanmei Airlines is making an “on & off board and on & off line” featured product platform. Lanmei Airlines keeps offering featured service and easy product portfolio to supply homelike flight experiences for passengers.